OpenStack Networking is a standalone service that often deploys several processes across a number of nodes. These processes interact with each other and other OpenStack services. The main process of the OpenStack Networking service is neutron-server, a Python daemon that exposes the OpenStack Networking API and passes tenant requests to a suite of plug-ins for additional processing. This service runs on the network node to service the Networking API and its extensions. It also enforces the network model and IP addressing of each port. The neutron-server requires indirect access to a persistent database. 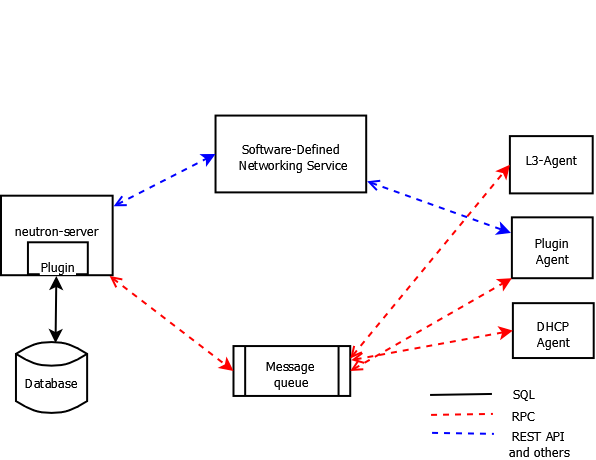 This is accomplished through plugins, which communicate with the database using AMQP (Advanced Message Queuing Protocol). Runs on each compute node to manage local virtual switch (vswitch) configuration. The plug-in that you use determine which agents run. This service requires message queue access and depends on the plugin used. Some plugins like OpenDaylight(ODL) and Open Virtual Network (OVN) do not require any python agents on compute nodes. Provides DHCP services to tenant networks. This agent is the same across all plug-ins and is responsible for maintaining DHCP configuration. The neutron-dhcp-agent requires message queue access. Optional depending on plug-in. Provides L3/NAT forwarding for external network access of VMs on tenant networks. Requires message queue access. Optional depending on plug-in. Provides additional networking services to tenant networks. 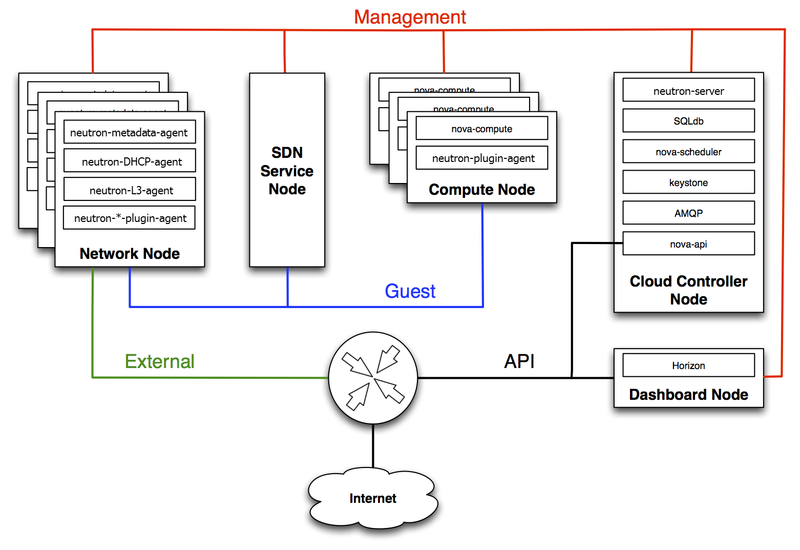 These SDN services may interact with neutron-server, neutron-plugin, and plugin-agents through communication channels such as REST APIs. This guide focuses on a standard architecture that includes a cloud controller host, a network host, and a set of compute hypervisors for running VMs. Used for internal communication between OpenStack Components. The IP addresses on this network should be reachable only within the data center and is considered the Management Security Domain. Used for VM data communication within the cloud deployment. The IP addressing requirements of this network depend on the OpenStack Networking plug-in in use and the network configuration choices of the virtual networks made by the tenant. This network is considered the Guest Security Domain. Used to provide VMs with Internet access in some deployment scenarios. The IP addresses on this network should be reachable by anyone on the Internet. This network is considered to be in the Public Security Domain. Exposes all OpenStack APIs, including the OpenStack Networking API, to tenants. The IP addresses on this network should be reachable by anyone on the Internet. This may be the same network as the external network, as it is possible to create a subnet for the external network that uses IP allocation ranges to use only less than the full range of IP addresses in an IP block. This network is considered the Public Security Domain. For additional information see the OpenStack Administrator Guide.